The pearl of Louisiana’s oyster industry is harvesting. Your customers can enjoy the sweet, salty flavor of raw Gulf oysters shucked at your oyster bar and served on the half shell, or used in your restaurant’s best dishes. AmeriPure are the cleanest Gulf oysters. Plump, salty, and delicious, AmeriPure oysters give your customers the natural Gulf Coast flavor they crave, but without the associated risks. They go through an all-natural, patented water bath process that removes potentially harmful Vibrio bacteria to non-detectable levels. The oyster shells are never opened until they are hand shucked, so their fresh quality, flavor and natural juices are preserved. Delicious, salty AmeriPure Oysters ready for sale to restaurants and institutions in-shell, or shucked. Our oysters don't open until you're ready to use them! These delicious, plump, raw bar-grade oysters have undergone the patented AmeriPure Process®, an all-natural post-harvest technology that reduces the potentially harmful Vibrio vulnificus and Vibrio parahaemolyticusbacteria to undetectable levels, thereby improving their safety. Q: Are AmeriPure oysters farm-raised? A: Our oysters are bottom cultivated in natural waters that meet the strict harvesting requirements of the National Shellfish Sanitation Program (NSSP). These waters are regularly monitored for quality assurance. 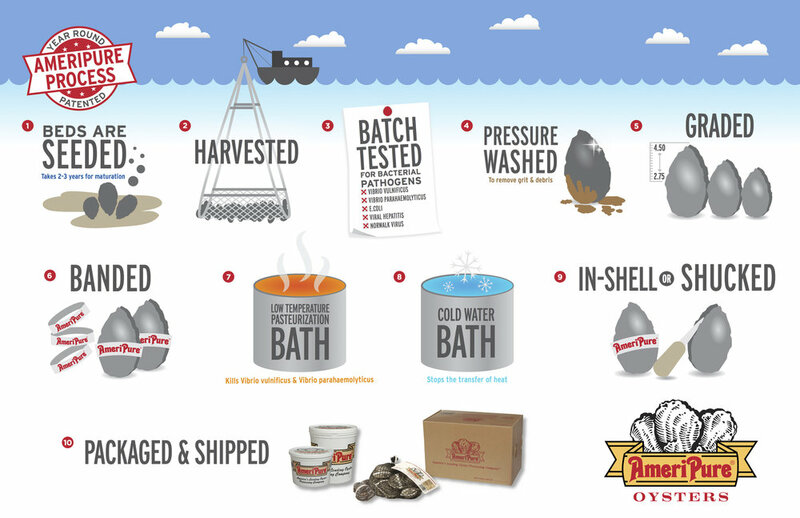 Q: What is the shelf life of AmeriPure’s in-shell oysters? A: We recommend 16 days from the date of processing. A Best-When-Used-By-End-Of-Day date appears on the blue control tag found inside of every box of in-shell oysters, as well as on the outside of every box. When properly handled (kept at, or below 38F, or on ice at all times) the product actually holds up well for as long as 21 days. As with any perishable product, the oysters should be rotated according to date to insure maximum freshness. Q: Why are the oysters banded? A: All of AmeriPure’s in-shell raw oysters are banded shut prior to undergoing the patented AmeriPure Process® to reduce the potentially harmful Vibrio vulnificus and Vibrio parahaemolyticus bacteria to nondetectable levels for added safety. The rubber bands prevent the oysters from ever opening up during the warm/cold shock phases of the AmeriPure Process®, thereby insuring that they retain all of their natural liquor and flavor. Q: Is the AmeriPure Process® the same as High Pressure Processing? A: No. These two post-harvest processes for raw oysters are very different. First of all, AmeriPure’s actual process is patented, as opposed to the material handling systems surrounding it. Secondly, the AmeriPure Process® does not expose the oyster to extreme pressure that forces the shell of the oyster open, thereby causing the loss of its natural liquor and flavor. AmeriPure oysters don’t open until you’re ready to serve them. Q: How do I know that the oysters have been processed by AmeriPure. A: First, check the control tag included in every box. The tag should have our company name and state license – LA 1811. If AmeriPure’s name is on the tag and the oysters have rubber bands around them – not plastic shrink bands – then you can rest assured that the oysters have been processed by AmeriPure to reduce the potentially harmful Vibrio vulnificus and Vibrio parahaemolyticus bacteria to nondetectable levels for added safety. There is no reason to be concerned if a few oysters in a given box are not banded. Some of the rubber bands slide off, or are cut off during transit. The oyster is still suitable for consumption. Q: Does the AmeriPure Process® affect the appearance, taste, or texture of the oyster? A: In terms of appearance, AmeriPure’s oysters are much cleaner and free of the grit and mud that often accompanies unprocessed in-shell oysters. In terms of taste and texture, there is virtually no change whatsoever. Q: How does the quality and yield of AmeriPure compare to traditional, or unprocessed raw oysters? A: AmeriPure buys its half-shell oysters from experienced oyster harvesters skilled at the art of cultivating half-shell quality oysters, as opposed to shucking oysters. Because are oysters are individually handled and inspected for the purposes of banding, the yield for our in-shell oysters is virtually 100%. We guarantee it. Q: What kind of yield can I expect from AmeriPure oysters? A: You can expect to find a minimum of 100 usable oysters in a 100-count box, or 150 oysters in a 150-count box. We purposely overpack our boxes to make up for the occasional dry, or empty shell oyster you may encounter. Q: Are AmeriPure oysters seasonal? A: No. Our oysters are available year-round. We ship product out on refrigerated trucks and air transport six days a week, 52 weeks a year.